You are standing in from of the mirror, all dressed up in your favourite Salwar Suit ready to seize the day. Even though you look your best, something seems amiss. Is it the lack of adequate makeup or are you having another bad hair day? Then, you stare at your face and realize a dash of bling is missing! 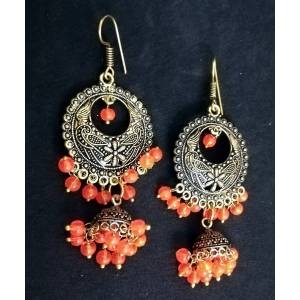 And you instantly reach out for your favourite pair of earrings and voila, you are good to go! We like to think that every pair of earring has a story to tell, whether you sport it with a Saree or your go to Kurti Hence, our latest collections of earrings are a definite must-have. Right from traditional Jewellery that sings to your ethnic loving heart to trendy essentials like exquisite engagement ring, Chaandbalis and so on for fashion favouring mind! A pair of earrings has the power to elevate your entire outfit to dizzying heights of true blue sartorial success- it can literally make or break your outfit. Keeping that in mind, our collection of earrings are made to make you style the ultimate success story! Dive into a collection that celebrates the necessity of a pair of earrings, be it any outfit and any occasion. 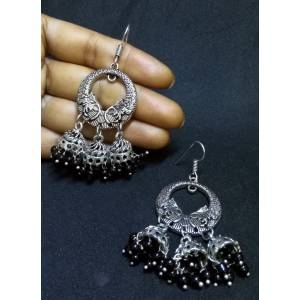 If you are an ardent follower of all things fashionable, you would have noticed the fact that the category of earrings gets a trendy makeover EVERYDAY! Keeping this very notion in mind, we have made it our priority to keep up with these ever changing trends and give you a plethora of choices. We have earrings for girls, earrings for women who are always on the run and are looking for something that they can sport every time they need to feel confident and comfortable in their own skin. Our collection of Chaandbalis will literally give Deepika Padukone’s Leela a run for her money! Looking for a pair of chic and fancy earrings? Take a look at our dazzling Danglers and you would keep coming back every day to shop a new pair. And speaking of fancy earrings, our large collection of timeless Jhumkis is the perfect blend of trend, tradition and allure. If you are all about that minimalistic charm, our range of sensational Stud earrings is just a click away. 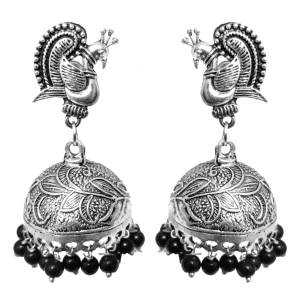 If you are someone who lives for Oxidized earrings but are just wary of going to a store and getting them, fret not! Come, fall in love with our collection and you would never feel the need to step into another store again. If your style is more boho chic and in sync with the latest trends, our collection of Afghani earrings will always be there for you. 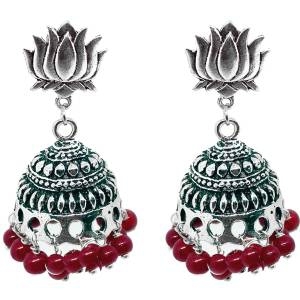 Want to go all out with earrings that make you stand out in style and are an outfit itself? Well, take a look at our exquisite Chandeliers and fall deeply, madly in love with this classic style. Our latest collection of dreamy designer earrings is definitely a sight to behold and definitely meets the requirements of fabulously fancy earrings. Have you ever shopped on and on but never really been satisfied with your purchases and ended up wearing it, well not even once? Fret not! We’ve a fool proof formula so you never end up buying the wrong pair that just feels ‘right’ at the moment. All you’ve to do is look at yourself in the mirror and let your face do all the work for you! Chubby cheeks; dimpled chin? Let the roundness of your face shine with a pair of long, drop shaped danglers that highlight the circular shape of your face and not enhance it. Have a heart shaped face? The trick is to draw attention to the narrow part of your face, hence always pick Chandeliers and Drop earrings that go with any outfit. A square shaped face is known for it’s sharp edges. The width of your jaw line, forehead and cheeks is close to being similar and it is the duty of your perfect pair to soften these sharp edges. Avoid square shaped studs at all costs! Always, always go for Ovals, Hoops or Drop beauties. The widest part of a diamond shaped face is its cheekbones. The easiest way to choose the right pair is to follow the shape of your face. Accentuate those gorgeous cheekbones with pretty pairs of Long Danglers & Small Studs. Avoid diamond shaped earrings no matter how pretty they are! Blessed are those who have an oval face, because their pretty faces can pull of any earring, be it any shape or size. 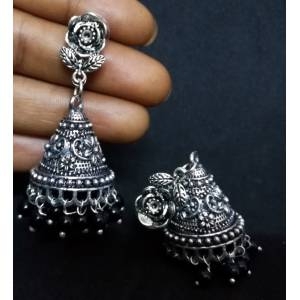 Choosing the right pair comes very naturally to your face shape and it is possible for you to go all out with Terracota Earrings, Studs, Danglers, etc. With the technology advancing at breakneck speed and Jewellery rapidly changing trends, shopping for timeless trends and designs like Necklaces , Earrings, Rings has become easier than ever and we at Craftsvilla aim to keep up with the trends by updating our collections with the latest styles every single day. Our latest Jewellery and their designs are not just stunning but also available at amazing, affordable prices, literally just a click away! We stand for the phrase- value for money and will always aim to create a wonderful, fulfilling shopping experience online. Shop with us and refresh your Jewellery chest every single day. Head to our website to get in on the latest trends or download our smart phone app to avail best prices and never-seen-before styles for timeless Lehengas that weave stories of style, no matter what the occasion demands.